Nina Katchadourian is an interdisciplinary artist whose work includes video, performance, sound, sculpture, photography, and public projects. Her video Accent Elimination was included in the 2015 Venice Biennale as part of the Armenian pavilion, which won the Golden Lion for Best National Participation. Exhibitions have included shows at the Serpentine Gallery, Turner Contemporary, de Appel, Palais de Tokyo, Istanbul Museum of Modern Art, Turku Art Museum, Museum of Contemporary Art San Diego, ICA Philadelphia, Brooklyn Museum, Artists Space, SculptureCenter, MoMA, and MoMA PS1. Katchadourian has been widely published nationally and internationally, including a monograph, Sorted Books, published by Chronicle Books in 2013. The Tang Museum exhibited Katchadourian's first museum survey in 2005. In March 2017, a traveling survey exhibition of her work titled Curiouser opened at the Blanton Museum in Austin, Texas, with an accompanying monograph. Following the Blanton, Curiouser opened at the Iris and B. Gerald Cantor Center for Visual Arts at Stanford University in September 2017, and Brigham Young Museum of Art in Provo, UT in March 2018. In 2016, MASS MoCA commissioned a film by Katchadourian called The Recarcassing Ceremony. A commission titled Floater Theater opened at the Exploratorium in San Francisco in October 2016, the same month that the Museum of Modern Art in New York presented Dust Gathering, Katchadourian's audio tour on the subject of dust, as part of their program "Artists Experiment." Katchadourian has received grants and awards from the New York Foundation for the Arts, the Anonymous Was a Woman Foundation, the Tiffany Foundation, the American-Scandinavian Foundation, and the Nancy Graves Foundation. Her work is in public and private collections including The Metropolitan Museum of Art, Blanton Museum of Art, Morgan Library, San Francisco Museum of Modern Art, Margulies Collection, and Saatchi Gallery. 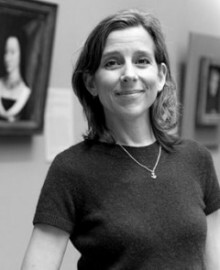 Katchadourian is an associate professor at the New York University Gallatin School of Individualized Study and has been represented by Catharine Clark Gallery since 1999. She lives in Brooklyn and Berlin. *Catalogues for Curiouser, published by UT Press, are available for purchase at Catharine Clark Gallery for $34.95.